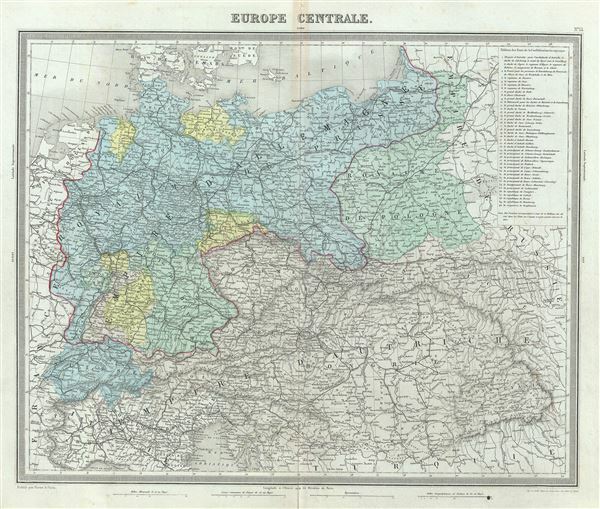 This is a fine example of Ambroise Tardieu's 1874 map of the Central Europe. It covers the German Confederation from the Baltic Sea to the Adriatic Sea and from Switzerland to the Austro-Hungarian Empire. The top right quadrant features a table listing the states of the German Confederation. Tardieu identifies various cities, roads, rivers, mountain passes and other topographical features. The German Confederation, created in 1814, acted as a buffer zone between Austria and Prussia, its two largest and most powerful member states. Nonetheless the rivalry between the two powerful states intensified until the outbreak of the Austro-Prussian War. Prussia won the Austro-Prussian War in 1866, ultimately leading to the collapse of the German Confederation. A few years later, in 1871, most of the former Confederation states were folded into the newly proclaimed German Empire. This map was prepared by Ambroise Tardieu and issued as plate 14 in his 1874 edition of Atlas Universel de Geographie Ancienne et Moderne. Very good. Minor wear and toning with verso repair along original centerfold. Original platemark visible. Minor spotting.